Additional Features: A gap of 200mm must be left on the hinged side of the product to allow the door to open. 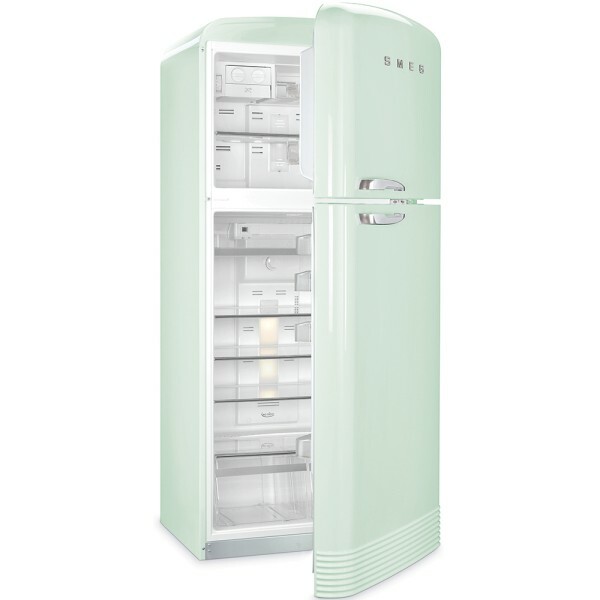 Product information "Smeg FAB50RPG 80cm Wide Retro Fridge Freezer"
The largest of the renowned Smeg retro refrigeration range is the Frost Free FAB50 fridge freezer. At 800mm wide it is aimed at fulfilling the needs of customers who require large capacity refrigeration without compromising on style. The Smeg FAB50's generous size and rounded edges is clearly reminiscent of the large capacity fridges which were typical in the 1950’s. With a generous total gross capacity of 484 litres, the Smeg FAB50 can easily fulfil the food storage requirements of even the largest family. Its refrigerator zone is equipped with 2 chiller compartments, 3 adjustable glass shelves and 2 large fruit and vegetable compartments. The durable door furniture has been designed to accommodate large bottles, milk cartons and jars with ease. there is a dedicated covered dairy shelf too. The Multiflow ventilation system distributes the air within the cabinet constantly and evenly to ensure optimum storage conditions and ensures that the chiller compartments, which are particularly suitable for storing meat and fish, maintain an ideal temperature of 0°C. The freezer features a manual ice maker, fast freezing compartment and interior light. The appliance is A+ rated for energy consumption. Related links to "Smeg FAB50RPG 80cm Wide Retro Fridge Freezer"
Customer evaluation for "Smeg FAB50RPG 80cm Wide Retro Fridge Freezer"